Recently a southwestern U.S. city with a fiber network needed to reliably network and remotely manage 120 traffic intersections from the city’s traffic management center. Before choosing a managed Ethernet switch to implement into their system, the city had to take into consideration a number of other requirements that needed to be met. A gigabit fiber backbone was required due to the bandwidth needed for streaming live video. Video streaming, signal controllers, conflict monitors, preemption detectors, and all other Ethernet connected devices needed to have 100% uptime. The city also needed an Ethernet switch that was flexible and had the ability to support single-mode and multi-mode fiber due to the different communication mediums between the intersections. Finally, due to the extreme temperature environments within a traffic cabinet, the managed Ethernet switch they chose had to be NEMA TS2 compliant, supporting a -40° to 74° C temperature range. With all of these requirements in place, the city searched for a managed Layer 2 field Ethernet switch that would meet the certification requirements requested and would provide multiple fiber uplink ports. Comtrol’s RocketLinx® ES8510-XT, a hardened NEMA TS2 certified managed switch, was selected by the city because it met all of the system requirements and provided the reliability they were looking for. The RocketLinx ES8510-XT switches were mounted into the traffic cabinets at each of the intersections and were a perfect fit for the harsh environmental demands within each cabinet. The city engineer also needed the Ethernet switch to support up to three fiber/Ethernet connections die to a number of locations that have two intersections connecting to a single intersection. 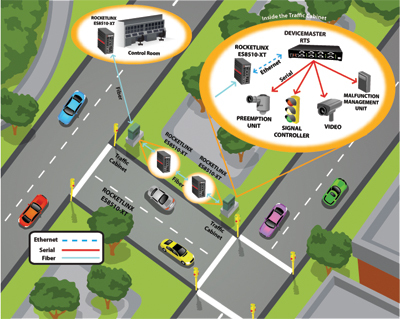 The three SFP and three copper uplink ports provided the ability to connect three intersections together with was not considered feasible by the traffic engineer before evaluating the RocketLinx ES8510-XT. The rugged aluminum, IP31 rated RocketLinx ES8510-XT was able to fulfill and exceed the needs that this city required for the traffic intersection project.